Late last week I got offered an amazing opportunity as part of the Blog Tour for City of Lost Souls Blog Tour. I am going to be interviewing Cassandra Clare while she is doing her UK tour when she visits Bath on the 1st of June. I jumped at the chance because you guys all know that next year or the year after Cassandra and her books and MOVIES are going to be huge. I really can' wait to get my hands on this book and I am excited to see what Cassie has to say about Sebastian. These are some questions i have about COLS, i would really appreciate if you asked to Clare.Also, will you upload the answers?? Sorry for any mistakes, english isn't my native language. Is there any chance that Sebastian will become good?? Is he always evil and only pretends to be good or there are times when he is not so diavolic?? How was Sebastian raised?? In a cruel and emotionless way?? Did Valentine show more affection to Jace? How does Sebastian feel about the other characters of the books like Jace, Alec and Isabelle after the events in COLS? What's his greatest motivation the need of power or love?? How does Jocelyn feel about her son after what happend? What did Sebastian meant when he said to Clary that their parents betrayed him? Well we already know about Jocelyn but what about Valentine?? Can he feel any emotions?? What is his point of view about the world, how does he see it?? Why does he feel the way he feels about his sister?? I know they are a lot of questions, i don't expect from you to ask them all. Please,pick the ones you want to ask more or the ones you believe people are more likely to ask!! I LOVED Clare's Mortal Instruments series, I still haven't read City of Fallen Angels but I can't wait to start it. 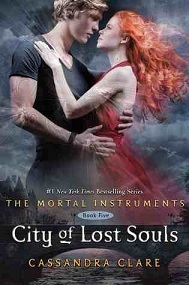 The cover for City of Lost Souls has to be my favorite of all Clare's covers.